April 7, 2019 - Palm Desert, Calif - On the patio at Mitch’s on El Paseo under a beautiful sunset, 175 people gathered for dinner to celebrate Jo Rosen and her 29 years of service to the Coachella Valley and beyond. Since 1990, Parkinson’s Resource Organization (PRO) has served countless people caring for and living with Parkinson’s disease, a disorder of the central nervous system which affects movement, often including tremors. Two PRO board members Michael Rudder and Michael Lu, who both suffer from Parkinson’s disease were honored. Michael Rudder, a successful businessman who has also survived brain cancer, a stroke, and a heart dissection was honored with PRO’s “Nine Lives” award. Michael Lu is a young man, only 30 years old, who works with and helps reintegrate individuals from a variety of socioeconomic backgrounds who suffer from medical, mental and physical disabilities. Lu was honored for his tireless positive attitude and given the “Winning at Life” award. Mitch Epstein said a few words about how Parkinson’s has affected his life as his favorite Uncle lived with and died from Parkinson’s. When Mitch’s favorite aunt found love again and married her new husband was later diagnosed with Parkinson’s, Illustrating the pandemic that the disease has become. Jo Rosen was presented with Proclamations from Rancho Mirage, Cathedral City, Indian Wells, Indio and the City of Palm Springs which declared April 7, 2019, as “Jo Rosen Day” in recognition of her work and the impact she is making globally for people caring for and living with Parkinson’s disease. Curtis Cannon spoke about his benefits from PRO as a caregiver. Dr. Samantha Peters and Laura Meeks both spoke about the benefits of PRO’s online Wellness Village, which is virtual, vetted Resource Directory and one of the main sources of revenue for Parkinson’s Resource Organization. 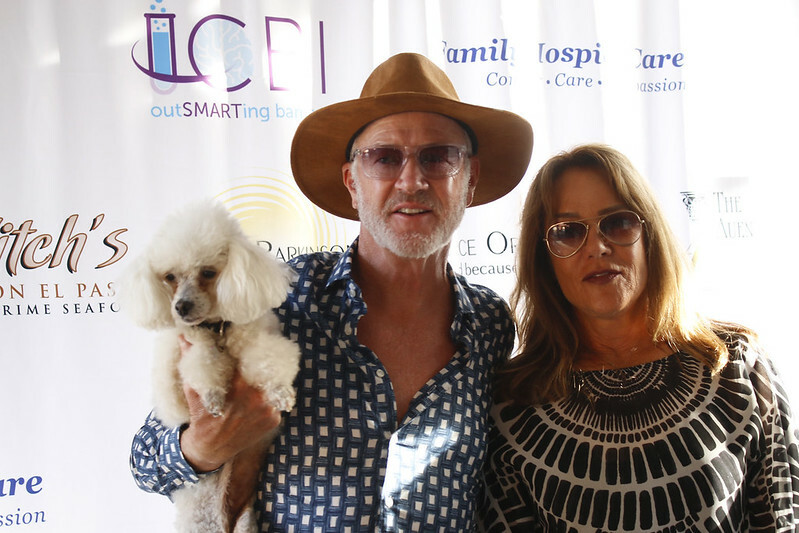 Actor Marc McClure, famous for his roles in Superman and Back to the Future, spoke about his relationship with Michael J Fox, and International singer, songwriter, and actor, Trini Lopez, an honorary member of PRO spoke of his admiration of Jo Rosen and his pride in being involved with such a great cause. After a silent auction with several one-of-a-kind trips and a Chinese auction with several themed packages, the grand prize drawing was the last surprise of the evening donated by Robert & Sharon Keith which included a one week stay at their home on Coronado Island. Founder Jo Rosen was the adult child of a person living with Parkinson’s and later a spouse of a person with Parkinson’s. She was inspired to create an organization that would advocate for, educate and provide emotional support for families affected by Parkinson’s. Now they are known worldwide with an online Wellness Village providing resources for Legal, Insurance, Financial Planning, Caregiving and Care Management, Medical Professionals, Hospice and Science as well as support meetings throughout Southern California. They are working so no one is isolated because of Parkinson’s and working to find choices in creating the ultimate quality of life. Click on the arrrows to view the photos from the event.